This one was inspired by our own family experience. We often find ourselves saying these lines to each other as we rush to get out the door. I’m sure we’re not unique! 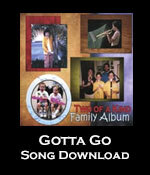 “Gotta Go” is a converging song, or as our friend Joanne Hammil calls them, an African-style Cyclical Song. The form originated in Africa. Each part is independent, with it’s own melody, rhythm, lyrics and entry point. All the parts converge on one word or a short phrase. The result is a very interesting, dynamic piece that is continually coming together and then breaking apart. I. (Jenny:) Hurry up, we’ve got to go right now! II. (Ari:) Oh no, forgot my lunch! I’ve got to go get it. III. (David:) You’ve got to go get on your shoes, or we’ll be late! IV. (Jason:) Hold on, I can’t hold it! I’ve just got to go! (All:) We’ve really got to go!